You need drugs to survive, but the more drugs you take, the harder it is to survive! If you find the thing that's alive, it will give you the key to escape the room. If you however ended up killing it, a horror truth will be revealed. NODE: Task list is in the TODO file. 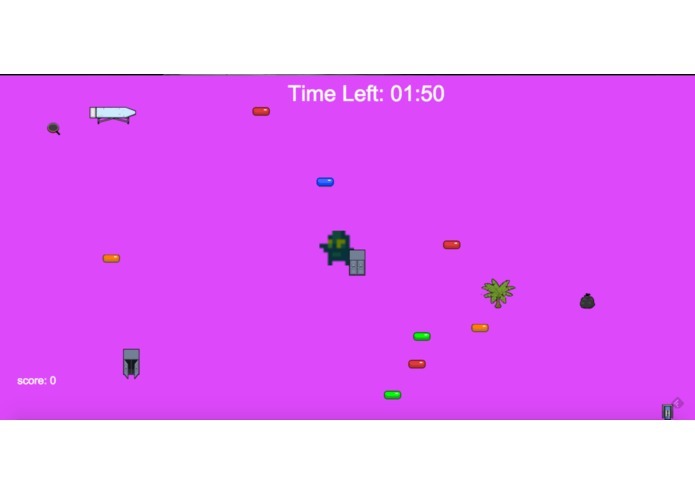 A movable character (black square) stands at the center of a 9x9 gray Room with 5 types of drug, differentiated by colors (red, blue, green, yellow, purple). As the character touched a drug, the background color changes to the drug's color, with some sound effect happens. Main character stuck inside a room with a drug shelf and some artifact (Teddy Bear, Flower Vase, a little girl?). He has some illness, and need to take some drug. The side effect of the drug he take make things around him becomes alive. He interact with them, and try to figure out what is really alive and what's not. Ambient background music surrounding, with a light shade of gradient on the foreground. Multiplayer where each person get a drug and each see the world and each other differently. I created the shake effects, added the object sprites, created the login screen, and helped create the login function.